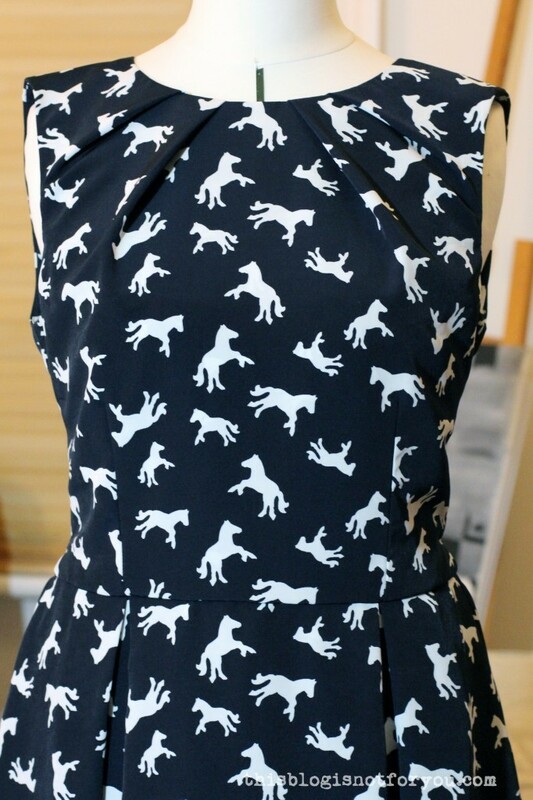 The Hepburn Dress and an army of horses! After weeks of working my bum off to finally get to the point of releasing my patterns, guess how I spent my first “day off”? 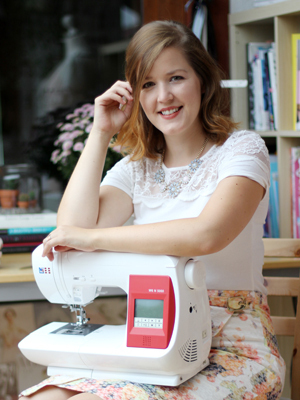 Yes, hemming, taking pictures, editing pictures and preparing blog posts. At least I managed to re-watch the second part of Season 1 Game of Thrones while I did that. Phew! So here it is (and yes, I feel a bit like a proud mum!) 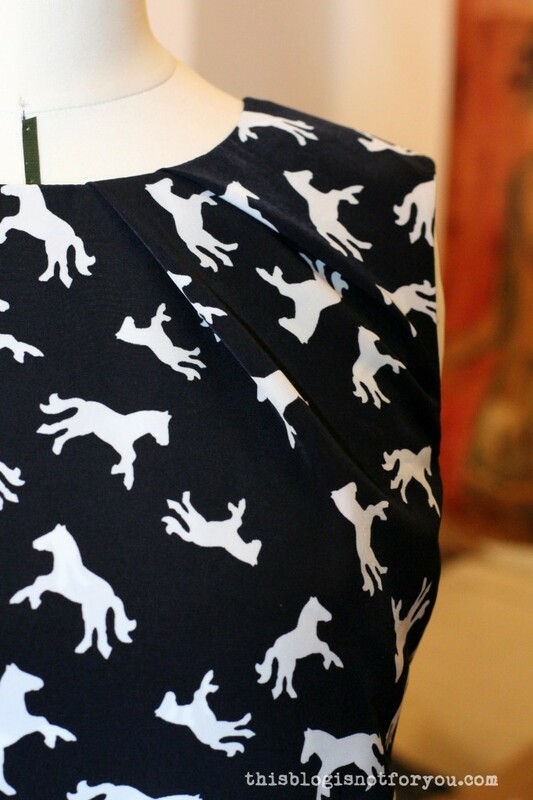 – Lady Hepburn, made with a navy polyester fabric with a horse print bought on Goldhawk Road. The fabric almost looks almost black in the pictures, but it’s acutally a really dark navy. The pictures are a bit crap today as I had to make to with tripod and self-timer inside the flat instead of shooting outside with the Mr. I made variation 1 which is my absolute favourite. I really like the neckline pleats as they give the classic 50’s shape a modern touch. The box pleats are quite wide and match up with the waist darts. This way they add quite a bit of volume to the skirt without making you look bigger than you are. I went with the hem option that ends at knee-length which is a bit more appropriate for work. The fabric was quite a bargain – I got it for £4/m at A1 Fabrics (if I remember correctly). It’s a peachskin polyester and the quality was surprsingly good. It’s quite heavy but drapes very well and is super soft and cool to the touch. The white parts of the fabric are not see-through at all and therefore, I could use the same fabric for lining the bodice. Soft inside out! I’m a bit disappointed that the summer seems to be over so suddenly. Luckily, the Hepburn neckline works really well with a cardigan, so I will be able to wear the dress at work in the next couple of months. 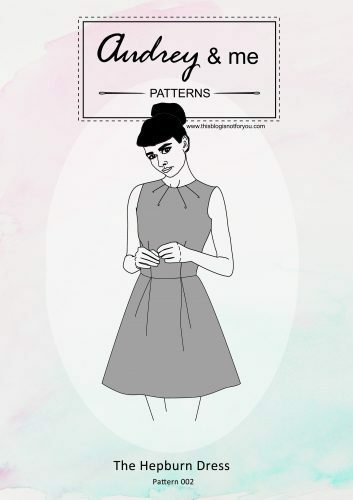 The pattern for the Hepburn Dress is now available as a Print-at-home PDF pattern! That is so fab! Love both pattern and fabric, they look gorgeous! Wow, that is stunning- what a feminine shape and I love that neckline detail! that neckline is woooooooooooooonderful! congratulations, lady! Gorgeous! 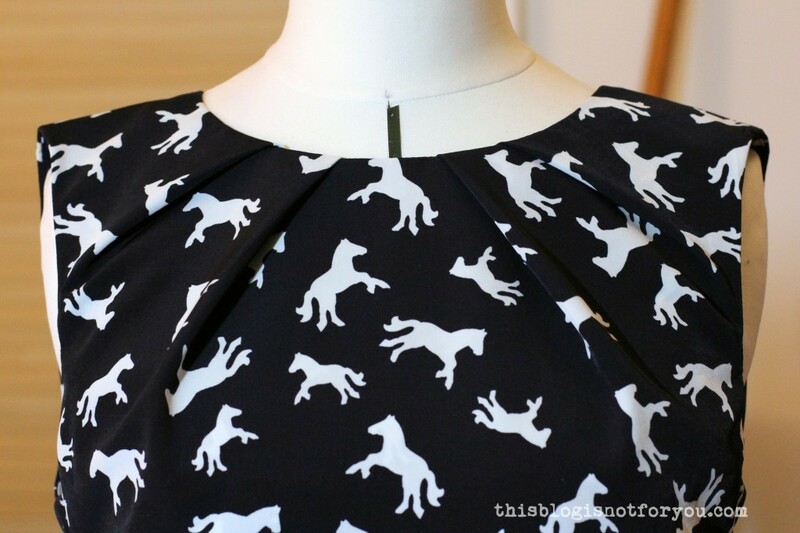 The neckline is beautiful, and I love the fabric. It’s gorgeous! 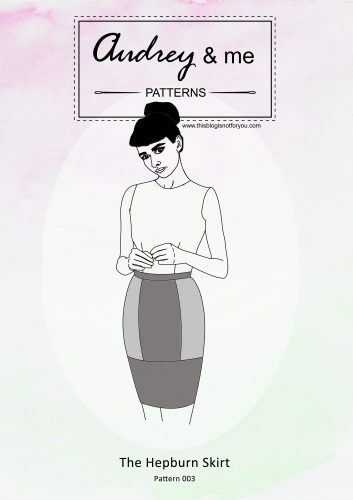 The pattern looks lovely in the line drawings, but even better made up – definitely adding it to my sewing plans! Great! Can’t wait to see your version when you make it! Loving this dress and the box pleats at the front. Georgeous! Aww, thanks! Glad you like it! It’s a really lovely shape. The neckline darts are exquisite. Fabulous!